If you are going to wear conventional traditional wear, these are the most desirable anklets for your wedding look. Studded with colorful stones, the subtle design is sure to add on to your beauty on the big day. Match it up with open toe footwear as covered footwear will hide the beauty of this exquisite piece of jewelry. Can’t let that boho chic love go? 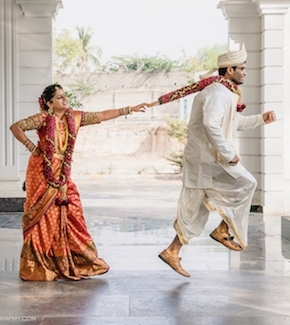 Well, don’t worry we have anklets for your wedding which will just match up with your taste. These anklets look wonderful with large stones and pearls and totally reflect the bridal look. If you want to go for something unique and catchy, this one is for you! If you are opting for flower jewelry, you can get something beautiful like these flower anklets for your wedding. The colors of flowers used to make the anklet make it perfectly fit for the day. Carrying a fresh look for the day is always a good idea! Isn’t it? Well, the traditional anklets always come with some Ghungroos on it and needless to say, they look pretty as well. The charming gold anklets will match up perfectly with any, almost any traditional bridal wear with gold embroidery or embellishments on it. If you don’t want the Ghungroos, you can go for the other option. These gold anklets for your wedding have beautiful and colourful meenakari design on it. If you have got some rubies and emeralds to flaunt on your wedding day, these anklets will go perfect with them as well. Well, it’s your big day, and probably the only day when you will be able to carry all those embellishments without any over-do guilt feeling. So, let’s utilize this opportunity to the best. These silver anklets for your wedding are polished in metallic gold colour and embellished with pink and white stones. There is also some pearl detailing along with the Jhumkis which makes it a pair to die for! You can get these anklets for your wedding if your wedding dress is embellished with pearls. The design is subtle and perfect if you don’t want a gaudy look. If you are planning to wear covered stilettos on your wedding, these anklets are all you need to balance the beauty of your footwear and this beautiful piece of jewelry. These silver anklets are for those who want to add a touch of modernity to the traditional sense of jewelry. The silver is oxidized so as to reduce the shine and had been molded into a floral design. A touch of Ghungroos is also given to get the essence of traditional anklets. 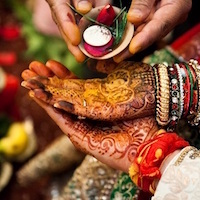 Indian brides are often supposed to wear their silver anklets even after the wedding day. These are perfect for wearing prior to the wedding as well. The popularity of Kundan jewelry is not required to be mentioned time and again. If you are also a fan of Kundan jewelry, then this goes for you. 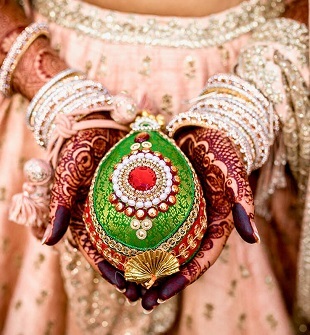 The latest trends allow you to match up your wedding attire with Kundan jewelry. So, which pair would you like to adorn on your wedding day? Share it on comments.